Neue Mondkarten und neue Grundlagen einer Mondkunde auf 16 Tafeln . -- Grünwald bei München: Philipp Fauth, 1932. Fauth published a number of works on the moon between his initial maps of 1895 (see item 33) and his death in 1941: a general book on the moon in 1907, a work espousing the glacial theory of the moon in 1925, a map in six sections adopting the new nomenclature system of the International Astronomical Union of 1935, and a comprehensive guide to the moon in 1936; all are in the Library's collections. In addition, he published these 16 studies for a large-scale moon map that he never completed. 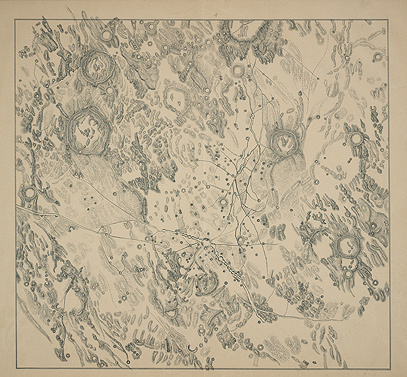 The lithograph maps vary in quality and technique; most of them use the same hachure shading technique of his early maps, while several use false contour lines instead, and indeed Fauth would shortly adopt the contour convention for his large map project, left unfinished at his death.